This weekend, Jan 27-29, muggles from around the world will come together to celebrate at the 4th annual A Celebration of Harry Potter, hosted by Universal Orlando and Warner Bros. Author J.K. Rowling has inspired many with her tales of the Wizarding World, and this three-day event will give fans the opportunity to immerse themselves in that world at Universal Orlando. For the first time ever, Tom Felton (Draco Malfoy), Jason Isaacs (Lucius Malfoy), and Warwick Davis (Professor Flitwick and Griphook) will attend the event, and will be joined by returning talent Matthew Lewis (Neville Longbottom). Enjoy Q&A sessions with Harry Potter film talent and other special guests. Explore the largest Harry Potter Expo in event history – full of experiences conducted by MinaLima, Warner Bros. Studio Tour London, Harry Potter: The Exhibition, Scholastic, Pottermore, Harry Potter and the Cursed Child, Google Daydream and Warner Bros. Interactive Entertainment. Attend a panel discussion about the process of creating creatures for the Harry Potter films with award-winning special make-up effects artist, Nick Dudman, joined by Warwick Davis. Learn the art of wand dueling hosted by the world’s only Wand Combat Choreographer, Paul Harris. Access The Wizarding World of Harry Potter – Hogsmeade at Universal’s Islands of Adventure and The Wizarding World of Harry Potter – Diagon Alley at Universal Studios Florida. Plus, board the iconic Hogwarts Express and journey between the two lands with a park-to-park ticket. Access to select events within A Celebration of Harry Potter is included in regular admission to Universal Orlando’s theme parks. Admission to panel events will be granted on a first-come, first-served basis. For more information about the event, visit UniversalOrlando.com/Celebration. 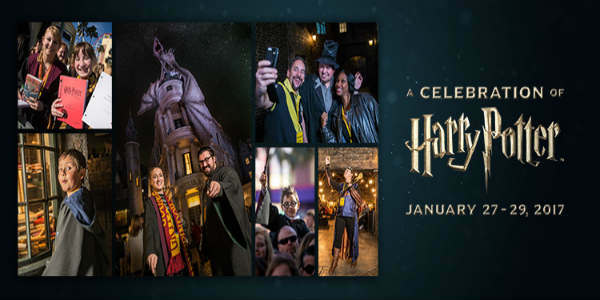 To join the conversation online, use #HPCelebration.